Little Big City Berlin tells the story of Germany’s capital city from the Middle Ages to modern day, using intricate replica models at a scale of 1:24. The miniature world is set up on two floors of the landmark TV tower building by Merlin Entertainments (the company behind Madame Tussauds and Legoland). From medieval farmsteads to the imperial age and the rise and fall of the Third Reich and the Berlin Wall, Little Big City Berlin presents big epochs in small scale. The model city is interactive, with plenty of moving, turning, and flying pieces. 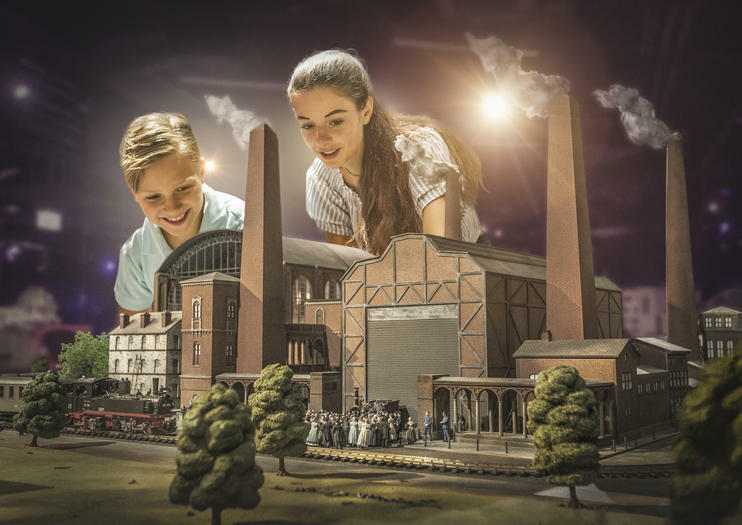 Captivating special effects and beautifully crafted 3D interactive miniature sets bring the visitor closer to the city’s history than ever before. Creating Little Big City Berlin was a three-year process, with each building requiring 15-20 hours just to paint. More than 5,000 residents 'live' in Little Big City Berlin, adults and children in figurines ranging from 2 to 3 inches (5cm to 8cm) tall. To reach Little Big City Berlin by public transit, take the S-Bahn or the U-Bahn to Alexanderplatzstation, which is only a couple minutes' walk from the attraction. Bus numbers 100, 200, M48, or TXL, and tram lines M4, M5, or M6 all stop at Spandauer Str. /Marienkirche station. Explore Berlin in a unique way with the Little BIG City experience. Learn about Berlin’s rich history through 3D miniature sets and projections that cover 750 years of the city’s timeline. Uncover stories and events that shaped Berlin throughout the years with projections and special effects all under an hour. Purchase the Berlin WelcomeCard for free admission to Berlin’s museums, majors attractions like the TV Tower and Olympic Stadium, free city bus and boat tours, and free city walking tours. Cardholders also receive discounts at a 20 different attractions, restaurants, and shows in Berlin. Purchase a 2-, 3-, or 4-day ticket and seamlessly travel through zones A, B, and C on public transport also included in the ticket price. Buying admission tickets to some of Berlin’s top attractions can really add up. Save money and plan ahead with this Berlin attractions admission ticket package. Choose from packages of two, three, or five admission tickets to attractions such as Madame Tussauds Berlin, the Berlin Dungeon, LEGOLAND Discovery Centre Berlin, AquaDom and SEA LIFE Berlin, and Little BIG City Berlin.